A part of Nanyang Technological University's (NTU) Jurong campus will be transformed into a vibrant public park over the next few years. The university is seeking ideas from leading architectural firms to develop the 9ha site, which includes the space in front of the Chinese Heritage Centre, Yunnan Garden and Nanyang Lake. Besides creating space for picnics and events, the plan seeks to showcase the historical significance of Yunnan Garden, the birthplace of Nanyang University in the 1950s. NTU officials said the space in front of the Chinese Heritage Centre will be turned into an area where large-scale events and gatherings can be held. 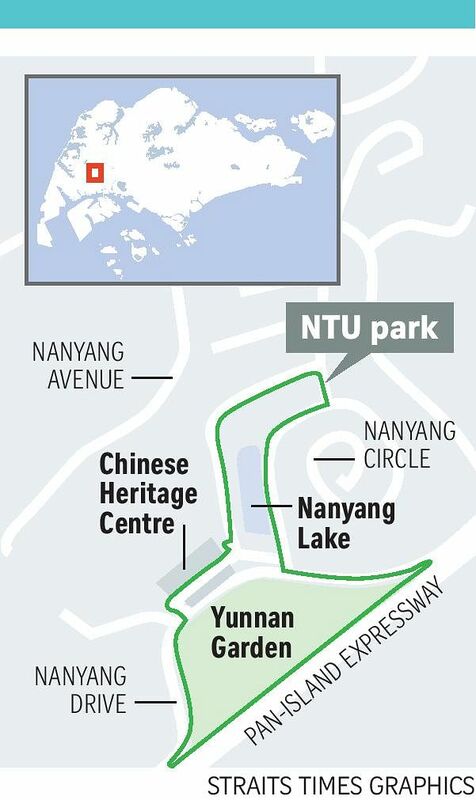 To create this space, a stretch of Nanyang Drive in front of the heritage centre will be diverted. More greenery will be added but planting will be carefully curated with a focus on medicinal plants, an area of research interest for the university, as well as trees that offer shade. Advice will be sought from the National Parks Board on suitable species that are local to the area, and also offer educational value. The park will include a multi- purpose lawn for student activities and fitness equipment for general use. NTU's president, Professor Bertil Andersson, said whenever foreigners visit the campus they are struck by the beauty of the sprawling 200ha campus. "Yet most Singaporeans, including Jurong West residents, don't know about it and don't think of using it for gatherings or picnics." He added that enhancing the green spaces will also balance the build-up of the campus in recent years. "With an enrolment of 34,000 students, more facilities such as teaching and learning spaces and residential halls have been added. "To balance that, we feel the need to do more to enhance the green spaces and make them more user-friendly." He noted that NTU, besides climbing international academic rankings, has also been acknowledged for its beautiful campus. Three years ago, it made the American Express Travel and Leisure magazine's list of the world's most beautiful universities. With an enrolment of 34,000 students, more facilities such as teaching and learning spaces and residential halls have been added. To balance that, we feel the need to do more to enhance the green spaces and make them more user-friendly. PROFESSOR BERTIL ANDERSSON, NTU's president. NTU alumni welcomed the news to develop parts of the university into a public park. Said NTU business graduate Alicia Tan, 36, who met her husband, an NTU engineering graduate, on campus: "The NTU campus is close to my heart as it is where I met my husband, on one of my evening runs. My husband and I still go back there to run. "I have always felt that the lush greenery and open spaces on campus are under-appreciated. "Turning parts of it into a park will enable more people to appreciate the beauty of the campus and enjoy it."